are part of Angela’s comprehensive services available for families, groups, and individuals. She has 15 years of field experience as a Master Outward Bound Instructor and was involved with developing one of the first wilderness based substance abuse treatment programs for adjudicated youth in the USA. During that time, she and her husband, Barry Jones, co-lead wilderness based trips for adjudicated youth (multi-day overnight trips). Today, they collaborate in utilizing adventure based interventions (day trips). Barry maintains international accreditation as a mountaineering guide ( www.ClimbOnInc.com ). In these situations, a simple walk outside might be enough to make the difference. In other situations, a more adventurous outing might make sense which could involve a 4-hour top-rope climbing experience instructed by my husband who has maintained his climbing guide service license ( climbinoninc.com ) since our careers with Outward Bound. Of course, these experiences are something that is chosen by the client based on mutual agreement that it might be offer a valuable component to the therapeutic process. Based on the client’s goals and desires, and with their permission, my husband and I tailor an outing experience specific to each person, family, or group. The experience and the equipment become metaphors or symbols for insight that might provide insight into the client’s situation. The elements of physical safety as well as emotional safety are always discussed as part of the preparation for these outings. 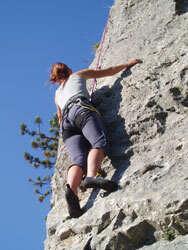 Learning how to manage the safety line of your climbing partner can be an empowering experience to build confidence. Plus, it can be loads of fun and very exciting! Since childhood, being outside with the elements of nature has always been a source of refuge and place of safety. Before we were married, my husband and I worked for many years as field instructors for Outward Bound. This early experience in our careers gave us opportunity to travel and see many parts of the world as well as gave us tramendous insight into the dynamics of how people work, or not, together. Working with sled-dogs is one of my favorite memories because it connected me to the bond I have always felt with my own dogs as pets but as equals, as partners in a common goal of work and achievment. Today, that connection is translated through my work as a Therapy Dog Handler. 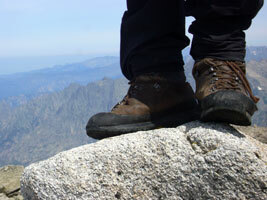 Although Adventure-based therapy is fairly new, a growing collection of research and literature on the topic (Association for Experiential Education ) provide insight into the valuable contribution this field of work is making in education, corporate management strategies, drug and alcohol abuse prevention and treatment, non-violent conflict resolution, physical fitness, policy development . . . the list could go on! In terms of counseling and therapy, for some people in some circumstances, traditional talk therapy is not an effective helping tool. These earlier reviews agree with the findings of Hattie, Marsh, Neill, & Richards (1997) that globally measured self-esteem has been found to increase following participation in adventure-based groups, although the transfer of these changes to other settings has not been empirically validated. Note this study was based on 1,728 effect sizes from 96 different studies of adventure programs. The Hattie et al. (1997) meta-analysis of adventure education programs found the strongest effect sizes for constructs related to self-control: independence (0.47), confidence (0.33), self-efficacy (0.31), and self-understanding (0.34). Interestingly enough, these effects were found to increase when individual follow-up assessments were conducted. The authors note that “adventure programs appear to be most effective at providing participants with a sense of self-regulation” (p. 70). Such findings speak to the power of this group approach—even as a recreational and educational vehicle—in enhancing individual group members’ ability for self-control in adventure therapy experiences. The use of outdoor adventure experiences for therapeutic and counseling groups is documented with numerous clinical populations, such as parents and adolescents (Gillis & Gass, 1993), couples (Gillis & Lindsay, 1991), those treated for substance abuse (Gass & McPhee, 1990; Gillis & Simpson, 1991, 1994), adjudicated youth (Bacon & Kimball, 1989; Kelly & Baer, 1968; Kimball, 1983), clients served in private practices (Berman & Davis-Berman, 1989) and psychiatric hospitals (Schoel et al., 1988, Stich & Senior, 1984; Stich & Sussman, 1981. Cason & Gillis (1993), Ewert (1989), Gillis, (1992), and Gillis & Thomsen (1996), have provided reviews of research into adventure programming that include references to therapeutic populations. Many of these reviews indicate that there is a lack of research in the therapeutic use of adventure. They are also critical of the experimental methodology used. Most studies lacked control groups, and few had any follow-up data. Newes’s (2001) recent critique of the literature specific to adventure therapy highlights the difficulty in empirically supporting adventure therapy. As Gillis & Thomsen (1996) noted, there is still no one clearly defined and researched method of conducting therapy with adventure activities; thus, the group therapist is left with little guidance for what type of adventure activity or setting is most effective with which client group. The researched programs offer confusing findings, since they utilize different adventure activities (wilderness expeditions versus ropes courses) and methods (educational, adjunctive, and primary), making comparisons among programs difficult. More troublesome is that the majority of research studies do not specify methodology (what they actually did that was considered therapeutic), so that the reader can determine if one program’s findings can be compared with another’s. There is no way to measure integrity of adventure therapy at this point in time. Newes (2001) provides some direction for researchers into adventure therapy, such as the use of dismantling and additive designs instead of comparative designs. Such direction is especially helpful to graduate students seeking different ways to improve and expand the use of adventure as a recognized treatment approach. In addition to strengthening research methodologies, we support a focus on significant change events in adventure therapy. A database for collecting case studies and results of therapeutic interventions across different adventure therapy groups remains a dream. Adventure therapists tend to be doers and not writers. There are few practitioners evaluating programs in order to inform practice through research that is both clinically relevant and statistically accurate. W. W. Norton.Review of, 43-87.Journal of Experiential Education,(2), 80-84. Reaching out (7th ed.). Boston: Allyn & Bacon.Outward Bound schools as an alternative to. Boston: Fandel.Journal of Experiential Education, 5(3),Dissertation Abstracts International, 50(06-B), 2628. (UniversityLos Angeles Times, pp. 14-18. Journal of Experiential Education, 24(2),Gestalt therapy verbatim. Moab, UT: Real People Press.Effective leadership in adventure programming. Journal of Experiential Education, (1), 34-39.Dissertation Abstracts International, 49(07-A), 1706. Cowstails and cobras II: A guide to games, initiatives, ropes courses, Hamilton, MA: Project Adventure.Quicksilver. Dubuque, IA: Kendall-Hunt.Therapeutic Recreation Journal, 21(2), 54-63.Bradford Papers Annual (Vol. 3). Martinsville, IN:Journal of Experiential Education, 24(2),Peoplemaking. Palo Alto, CA: Science and Behavior.Psychotherapy,(4), 657-668 Islands of healing: A guide to adventurebasedHamilton, MA: Project Adventure.Advances in treating the young adult(pp. 103-108). San Francisco: Jossey Bass. Outward Bound An adjunctive psychiatric(ERIC Document Reproduction Service No.Journal of Experiential(1), 17-22.The exploration of the Outward Bound process. Denver, Dissertation Abstracts International, 4728822) (08-B), 3549. (University Microfilms No. AAD86-Pragmatics of human communication. New York: Norton.Change. New York: Norton. Handbook of family therapy. http://www.geocities.com/aee_tapg/tapg.html. Association for Experiential Education (AEE). 2003. Retrieved from www.aee.org. Association for Specialists in Group Work (ASGW). (2000). Association for Specialists in Group Work: Professional standards for the training of group workers.in Group Work, 25 Bacon, S. (1983). CO: Outward Bound. (ERIC Document Reproduction Service No. ED296848). Bacon, S. B., & Kimball, R. (1989). The wilderness challenge model. In R. D. Lyman, S. Prentice-Dunn, & S. Gabel (Eds. ), Berman, D. S., & Davis-Berman, J. L. (1989). Wilderness therapy: A therapeutic adventure for adolescents. Blatner A., & Blatner, A. (1988). Practice. Cason, D. R., & Gillis, H. L. (1993). A meta-analysis of adventure programming with adolescents. Creal, R. S.. & Florio, N. (1986). The family wilderness program: A description of the project and its ethical concerns. In M. Gass & L. Buell (Eds. ), Annual AEE Conference: The season of ingenuity: Ethics in Experiential Education CO: Association for Experiential Education. Crisp, S. (1998). International models of best practice in wilderness and adventure therapy. In C. Itin (Ed.) Davis-Berman, J., & Berman, D. S. (1994). Perspecxtives and research de Shazer, S. (1982). York: Guilford, Ewert, A. (1989). Worthington, OH: Publishing Horizons. Gass, M. A. (Ed.). (1993). Gass, M. A., & Gillis, H. L. (1995b). Constructing solutions in adventure therapy. Journal of Experiential Education, 1 Gass, M., & McPhee, P. (1990). Emerging for recovery: A descriptive analysis of adventure therapy for substance abusers. Gass, M. A. & Gillis, H. L. (1998, November). Programs in traditional office settings. Experiential Education 26th Annual International Conference, Lake Tahoe, Nevada. Gillis, H. L. (1992, January). Theory and research in the Outdoors Symposium. Martinsville, IN: Bradford Woods, Indiana University. Gillis, H. L., & Bonney, W. C. (1986). Group counseling with couples or families: Adding adventure activities. Gillis, H. L., & Bonney, W. C. (1989). Utilizing adventure activities with intact groups: A sociodramatic systems approach to consultation. 345-358. Gillis, H. L., & Gass, M.A. (1993). Bringing adventure into marriage and family therapy: An innovative experiential approach. Gillis, H. L., Gass, M. A., Bandoroff, S., Rudolph, S., Clapp, C., and Nadler, R. (1991). Family adventure survey: Results and discussion. In C. Birmingham (Ed.) of the 19th Annual AEE Conference Education. Gillis, H. L., & Lindsay, J. F. (1991, April). Pair-enting: Adventure-based counseling for parent and adolescent wellness. Paper presented at the Annual Conference of the American Association of Counseling and Development, Reno, Nevada. Gillis, H. L., & Simpson, C. A. (1994). Working with substance abusing adolescents through Project Adventure. Gillis, H. L., & Thomsen, D. (1996). A research update (1992-1995) of adventure therapy: Challenge activities and ropes courses, wilderness expeditions, & residential camping programs. Paper presented at the [OK?] Coalition for Education in the Outdoors Symposium Proceedings, Martinsville, IN: Bradford Woods, Indiana University. Gillis, H. L., & Ringer, T. M. (1999). Therapeutic adventure programs adventure programming. Simon Priest & John Miles (Ed. ), Venture Publishing, State College, PA [Not a complete citation] Haley, J. (1973). Hattie, J. A., Marsh, H. W., Neill, J. T., & Richards, G. E. (1997). Adventure education and Outward Bound: Out-of-class experiences that make a lasting difference. Educational Research, 67 Kelly, F. J., & Baer, D. J. (1968). institutionalization for adolescent delinquent boys Kimball, R. (1983). The wilderness as therapy. 6-9. Maizell, R. S. (1988). Adventure-based counseling as a therapeutic intervention with court-involved adolescents. (Microfilms No. AAD89-21901) Morgenstern, J. (1995, January 15). A death in the wilderness. Magazine Newes, S. L. (2001). Future directions in adventure-based therapy research: Methodological considerations and design suggestions. 92-99. Perls, F. S. (1969). Priest S., & Gass, M. A. (1997a). Champaign, IL: Human Kinetics. Priest, S., & Gass, M. A. (1997b). An examination of “problem-solving” versus “solution-oriented” facilitation styles in a corporate setting. 20 Rice, S. (1988). A study of the impact of long-term therapeutic camping on self-concept development among troubled youth. (University Microfilms No. AAD88-19365) Rohnke, K. (1989). and adventure curriculum. Rohnke, K., & Butler, S. (1995). Roland, C., Summers, S., Freidman, M., Barton, G., & McCarthy, K. (1987). Creation of an experiential challenge program. Roland, C., Keene, T., Dubois, M., & Lentini, J. (1988). Experiential challenge program development in the mental health setting. Bradford Woods Outdoor Center. Russell, K. (2001). What is wilderness therapy. pp. 70-79. Satir, V. (1972). Scheidlinger, S. (1995). The small healing group: A historical overview. 32 Schoel, J., Prouty, D., & Radcliffe, P. (1988). Stich, T. F., & Senior, N. (1984). Adventure therapy: An innovative treatment for psychiatric patients. In B. Pepper and H. Ryglewicz (Eds. ), chronic patient Stich, T. F., & Sussman, L. R. (1981). therapy: Preliminary research findings. (ED239791). Thomas, J. (1980). Sketch of a moving spirit: Kurt Hahn. Education, 3 Walsh, V., & Golins, G. (1976). CO: Colorado Outward Bound School. Walton, R. A. (1985). Therapeutic camping with inpatient adolescents: A modality for training in interpersonal cognitive problem-solving skills (self-esteem residential treatment). Waltzlawick, P., Beavin, J., & Jackson, D. (1967). Waltzlawick, P., Weakland, J., & Fisch, R. (1974). Whitaker, C. A., & Keith, D. V. (1981). Symbolic-experiential family therapy. In A. S. Gurman & D. P. Kniskern (Eds. ), Wichmann, T. F. (1991). Of wilderness and circles: Evaluating a therapeutic model for wilderness adventure programs.